To celebrate GIS Day 2016, a group of students at NYU Abu Dhabi from David Wrisley‘s undergraduate class AHC AD 139 “Introduction to Digital Humanities” met up with Matt Sumner, Data Services Librarian from NYUAD’s Center for Digital Scholarship to explore a set of Soviet 1:100K maps made of the United Arab Emirates (UAE) in the late 1970s held in NYU’s Spatial Data Repository. Maps produced by the Soviet military were believed to be used as an organizing framework for knowledge about the world and were compiled through a combination of aerial intelligence and on-the-ground observation. Sheet numbering is based on the alphanumeric system adopted by the International Map of the World (IMW), in which the globe is divided into equal-sized zones based upon latitude and longitude. Each zone is further subdivided so that the position of a sheet at the full range of scales can be deduced. The date and factory of production of each map are provided in a unique code that is embedded within the outer border, usually at the bottom right. As background reading for the GIS Day, the students in AHC AD-139 read this short piece about Soviet map making of Washington, DC, that underscores the uncanny precision (and also the curious errors) found in such maps. Our maps of Abu Dhabi exhibit similar interest in specific elements of built space and waterways, but are not as precise as those of Washington, DC. They are, however, particularly interesting since they were made soon after the formation of the UAE as we know it today. The UAE has experienced rapid growth since then and is celebrating its 45th year this December. After discussing the general benefits of having infrastructure in the study of the spatial humanities, we jumped into some hands on with ArcMap. 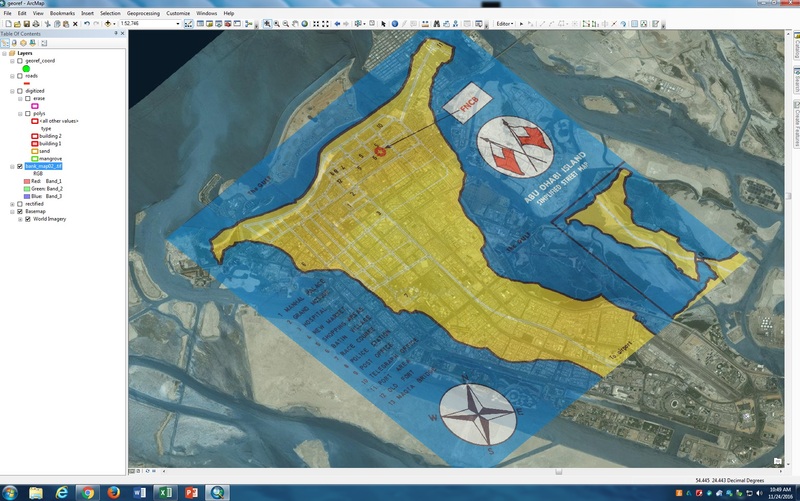 We practiced geo-referencing one of the sheets including the city of Sharjah, both by using topographic features and by the geo-coordinates provided in the corners of the sheet. 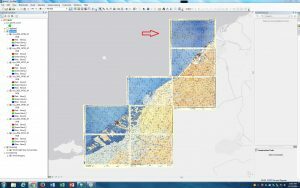 We added that geo-referenced sheet to a number of others showing the Gulf coastline of Dubai and Abu Dhabi. The image below shows the position of the Sharjah sheet indicated by the red arrow, tiled together with the others. We used shape files and base maps as layers to investigate (1) potential historical change of land and built space in this rapidly growing part of the world, as well as (2) how map makers’ choice of features help us understand the motives of their cartography. In particular we were struck by the changing water borders, both on the Arabian Gulf and the estuary systems and were left wondering if Soviet cartography tends to exaggerate them, or if, in fact, there has been dramatic change in the last half thirty-five years. We were lucky to have a Bulgarian student who could decipher the Cyrillic legends on the map for us. Last, we took an object from NYUAD’s Archives and Special Collections, a small city map distributed by the First National City Bank (FNCB) of Abu Dhabi. They found this small treasure tucked inside our edition of Clarence Mann’s Abu Dhabi: Birth of an Oil Shaikhdom published at Khayat’s in Beirut in 1964. An Emirati student in the class suggested that it must date from before unification (1971) since the flag represented on it is that of the Abu Dhabi emirate and not the UAE. You can read more about this document here. We scanned and geo-referenced it the FNCB map. This was a very interesting counterpoint to the Soviet maps since as a self-declared “simplified map” its point was not to be topographically accurate, but rather topologically useful for the recipient, ostensibly a new resident of Abu Dhabi doing business with the bank. It is also a map made from within Abu Dhabi as opposed to the Soviet maps made from without. 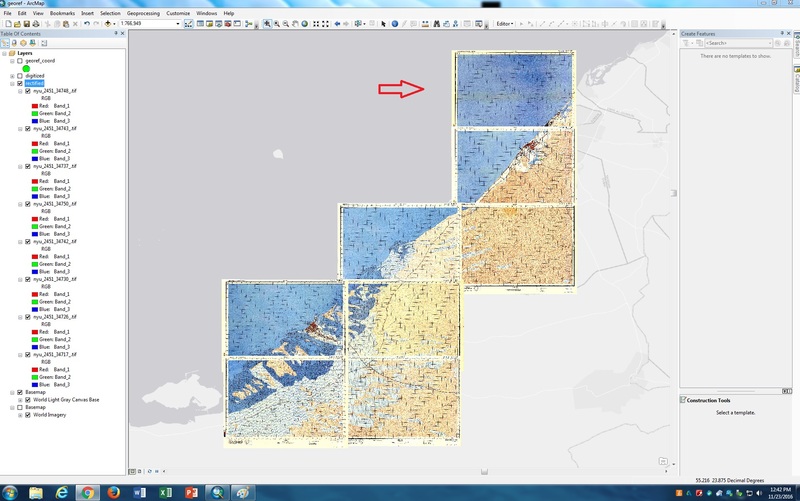 The students participating in the GIS Day 2016 were struck by how iterative and experimental use of geo-referencing within a GIS can serve a way of comparing different forms of spatial representation (Presner et al.) and creating hypotheses about the motives behind cartography. The students of AHC AD 139 are participating in NYU’s web hosting pilot. They are also writing blogs about today’s GIS Day. You can see those postings along with the other other reflective writing of the semester here. GIS Day 2016 is one of our Digital Humanities Meetups at NYUAD in 2016-17. The schedule of the others can be found here. Special thanks to Nicholas Martin, head of Archives and Special Collections for lending us the fold-out map!